It was confirmed yesterday that Manchester City are keeping a close eye on the youth talent at Real Mallorca by their director and they have now completed their first signing from the club. 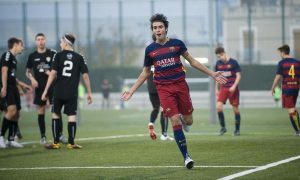 Now it is reported by Diario De Mallorca that Pep Guardiola’s men have snapped up right-back Richard Dionkou (15) from the club, the player will join at the start of next season. The youngster had attracted the likes of Barcelona, Real Madrid and Atletico Madrid, but he opted for Manchester. Manchester City were able to sign the player on a free transfer despite him having a contract with RCD Mallorca, but City are expected to pay some sort of compensation. Richard Dionkou is recognised for his physical power as well as his speed, making him one of the hottest prospects around. Whether there is a partnership being established between the two clubs remains to be seen but may well be possible as Angelino joined the Spanish side on loan in January.